With 2018's high-profile phone launches now behind us, it's time to look ahead to what next year will bring. One of the first and most anticipated releases in the calendar for 2019 is the Samsung Galaxy S10, which we will probably see unveiled at the end of February during MWC in Barcelona. Evan Blass has just shared some details about the device. Blass, aka @evleaks, is pretty reliable, so we can likely trust the following information. 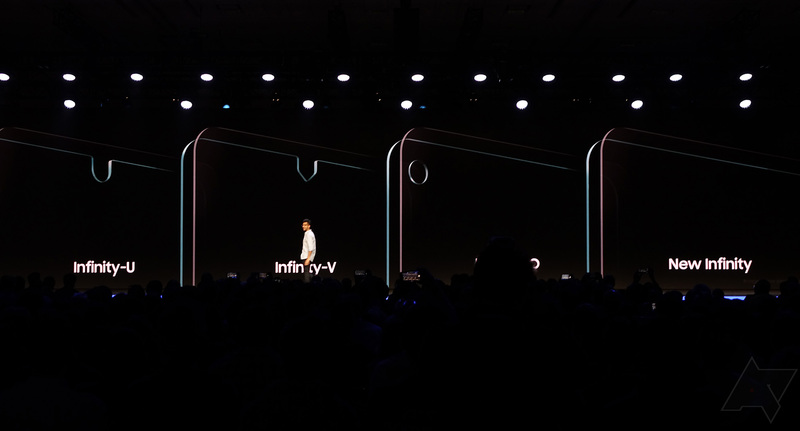 According to the serial leaker, the Galaxy S10 will come with an Infinity-O display (third from left in the above image). It was shown off at Samsung's developer conference with a range of other options and includes, in this case, a 'punch hole' cutout. We've not yet come across that in a phone, so it will be interesting to see how Samsung implements it, especially since the Korean company has avoided any kind of notch up to now. The already futuristic screen will apparently also have an in-display fingerprint scanner similar to the Huawei Mate 20 Pro or OnePlus 6T, except Samsung's version will use ultrasonic waves. You can see how that works in the Qualcomm video below. Other details shared by Blass include three cameras on the rear. The combination is said to be "standard/wide/tele," which is probably most people's prefered setup, so good on Samsung if that's true. An earlier report also suggests the phone will have two cameras on the front (does that mean two cutouts?). Unsurprisingly, the S10 is also expected to launch with Samsung's new One UI over the top of Android 9 Pie, with a new dark theme in tow. Some of these specs were already floating around the internet a month ago, but they are now have added credibility. More rumors and leaks are sure to arrive in the near future, so keep your eyes peeled. If this new version of the S9 is anything to go by, we could see some snazzy colorways when the S10 is launched.